It’s 1929 and movie director Max Beecham and his actress wife Eleanor hobnob with Charlie Chaplin, Greta Garbo, Douglas Fairbanks, Mary Pickford, John Barrymore, Gloria Swanson and more. To them, Max and Eleanor are the happiest, most loving couple in Hollywood. But the Beechams are excellent actors. They haven’t been happy since they left their old lives behind in New York, together with their tiny daughter, Isha. While Max seems to have given up, Eleanor is still determined to find her, or at least find out what happened to her. This sets the backdrop for Daisy Waugh’s latest novel, Melting the Snow on Hester Street. The glamorous aura of the movie industry during Hollywood’s “Golden Era” makes an excellent setting for a novel. With this backdrop, Waugh focuses her story on the Beechams, the people they really were (aka Matz and Elena Beekman) and the mystery behind their missing daughter. This brings the reader back to earlier in the century and the other side of the country – to New York in 1911. It was there, in the slums teeming with immigrants, that hundreds were employed in “sweat shops” making clothing. This was also the place where one of the most horrifying and deadly industrial accidents occurred – the fire at the Triangle Shirtwaist Factory. In this way, Waugh goes from human tragedy to financial disaster – from the Triangle fire to “Black Tuesday” of the great Stock Market Crash of 1929. Waugh uses an effective tool to tell the earlier story. Rather than depend on flashbacks, she has Eleanor employing a private investigator in Reno, Nevada (also known as the divorce capital of America). When the owner of the agency dies, the new owner, his son Mathew, writes to her about it and casually invites her to meet with him, in order to help further the case. Mathew doesn’t know who he’s writing to, and only when Elena shows up does he recognize her as Eleanor Beecham. As she attempts to fill in the holes of the story, both the reader and the investigator discover more of the truth, including why they changed their names and left their daughter behind. What’s left unsaid to Mathew is told to us through Eleanor’s private thoughts. All this is a fascinating premise for a novel, with real-life events that change the lives of these fictional characters. This ready-made drama is heightened by their being placed in situations that force them to hide both their true feelings and their identities. This would be a strain on anyone, and is obviously contributing to their teetering marriage and the downturns to their careers. With so many opportunities for turmoil, after a slightly slow start, this novel quickly becomes a fast paced page-turner. Waugh also makes Max and Eleanor into characters that have far more depth than the typical tabloid personalities, making them sympathetic to the reader. This is all done with an elegant language style that mirrors the eras of the settings. For such a story, one must know something about Hollywood. Despite her British origins, author Daisy Waugh is such an author. She learned about it first hand from her time as a screenwriter and journalist there. Drawing on this, Waugh obviously researched the era, and most of the historic information seems very accurate. The major events that form the borders of the story mix well together with the real actors of the time, the plot, and the events portrayed. What Waugh has achieved with this is a story with a timeless atmosphere, and that’s not easy to achieve. The only exception to this was an aside regarding one real-life character which refers to an event several decades in the future. It might have been preferable to leave that out, but on the other hand, without this remark some people might not get the historical reference. Keeping things culturally accurate by using experts rather than personal knowledge and experience has its drawbacks. That Max/Matz and Eleanor/Elena are Jewish immigrants is historically correct for both Triangle and Hollywood. Waugh’s injections of Yiddish (the language of Ashkenazi Jews) in the book also work well, because Matz and Elena are from Eastern Europe. Unfortunately, the uncorrected proof copy received for this review included errors having to do with Jewish culture. Thankfully, according to the author, most of these were removed from the final hardcover publication. Still, it would be a good idea if Jewish readers wait for the paperback version, where all of those mistakes will be removed. All told, this is a very interesting and well written novel. The characters are likeable, and the timeframes and the settings are fascinating ones. Waugh’s style also fits the era perfectly and she brings complex situations into focus without ever confusing the reader, with a tiny twist that keeps the ending from being clichéd. The uncorrected proof copy doesn’t have the historical photographs at the end, but it can easily be assumed that the addition of those will draw readers even further into this story. 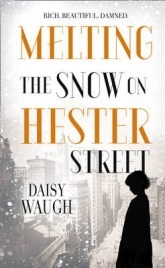 For all of this, Melting the Snow on Hester Street by Daisy Waugh is recommended and deserves a solid four stars out of five. With thanks to the publishers for sending a review copy. One Comment on "Melting the Snow on Hester Street"
Thank you for this great review. We liked this book too, very readable, and great feel for the ‘Gatsby’ era of North America.